A major free agency signing in 2016, DT Malik Jackson said during OTAs a second year in the Jaguars defense will help him see things on the field unfold faster. Despite that, Jackson still played well in his first season with the Jaguars. His PFF grade of 84.0 was 12th among all interior defenders, while his pass rushing grade of 82.3 ranked eighth. In 2016, Jackson had 55 total QB pressures which ranked fifth out of 68 qualifying interior defensive linemen. 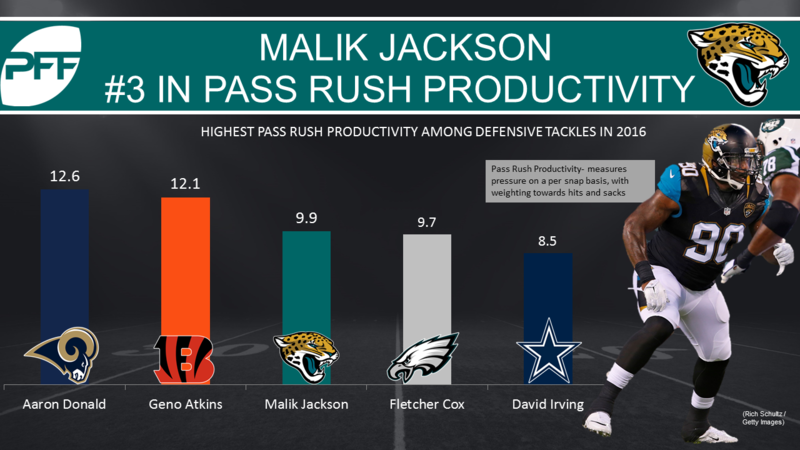 Jackson’s pass rushing productivity (which accounts for the percentage of pressures a player gets accounting for how often they rush the passer) of 9.9, ranked third amongst all interior linemen in 2016. With Calais Campbell joining Jackson on the defensive line and their young edge rushers gaining another year of experience, the Jaguars defensive line has the potential to wreck havoc on opposing offenses in 2017.